Videos based on Margaret S. Mahler's research on child development are available for rental to professional audiences through the Mahler Foundation Film Library. The footage was extracted from Mahler's the original research data which provide the foundation for Mahler's theory of separation-individuation. Dr. Mahler narrates the original three films depicting the process by which a child attains his or her sense of self and individuality while coming to recognize the caregiver as a separate individual. These films are valuable resources for training institutions for advanced clinicians and for developmental researchers. The Psychological Birth of the Human Infant, the first of Mahler's films received many accolades on publication. This 48-minute video focuses sheds light on the steps by which the infant gradually gains a sense of separation from the mother and forms the core of his/her personality. It effectively demonstrates examples of the child's journey through the differentiation, practicing, rapprochement, subphases "on the way" to self and object constancy. "This film makes psychoanalytic developmental theory come to life," noted Dorcas D. Bowles, Ed.D., Acting Dean and Coordinator of Field Work, Smith College School of Social Work. PART I: "Symbiosis and the Differentiation Subphase: 0 to 8 Months"
PART II: "The Early Practicing Subphase Proper: 8 to15 Months"
PART III: "The Rapprochement Subphase and On the Way to Object Constancy: 13 to 36 Months"
A 43 minute video depicting ( those phenomena of the separation-individuation process that pertain to the development of the sense of self during the first eighteen months of life. Emphasis is placed on showing) how early interaction patterns between mother and child are internalized and become part of the developing self. (In the second edition of the Mahler videos, Drs. Anni Bergman, Harold Blum, John McDevitt, and Fred Pine address significant advances which have been made in separation-individuation research and theory. Each update runs approximately 10 minutes). A Comment on a Controversy by Fred Pine, PhD responds to the critique of the symbiosis concept and then briefly summarizes the separation-individuation process. Continuity of Conflict and Compromise Formation From Infancy to Adulthood: A Twenty-Five Year Follow-Up by John B. McDevitt, MD uses research data from the original study and follow-up with the same subjects to show how the infant may develop internal conflicts early in life. 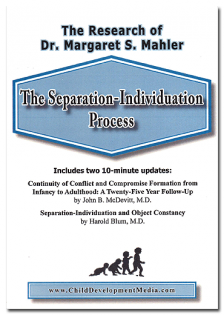 Separation-Individuation and Object Constancy by Harold Blum MD outlines the development path to object constancy and explores Mahler's extension of the concept and its functional significance in development. Reconsidering the Beginnings of the Sense of Self by Anni Bergman, PhD discusses the separate self as a unique construction which begins with unique mother-infant interactions during the symbiotic phase and continues to develop throughout the separation-individuation process and later life. All four updates are available in one 38-minute video: Margaret Mahler Updated. Upon request, transcripts of these updates (in English) are available for orders from outside the U.S. The Power of the Relationship introduces Dr. Anni Bergman's important contributions to separation-individuation theory developed by Margaret Mahler and to psychoanalytic therapy of children with serious attachment disorders. Director Florian Michel weaves together the threads of Dr. Bergmans life and career, allowing viewers to not only understand the psychoanalytic treatment of children and its theoretical underpinnings, but also the value of naturalistic, observational research and long-term intensive therapy. Dr. Bergman and her colleagues, including Dr. Fred Pine, Dr. Manuel Furer, Dr. Steven Ellman, Dr. Beatrice Beebe and Dr. Catherine Monk, eloquently discuss the history and findings of separation-individuation research and how it has been applied to the treatment of severely disturbed children. Of particular interest are the descriptions of a Ph.D. training program at the City University of New York founded by Anni Bergman and colleagues for the treatment of inner city children. The interviews of Dr. Bergman and her colleagues are vividly illustrated with original film footage from the separation-individuation research and from the long-term treatment of an autistic girl. Remarkably, we see this autistic girl, and another child who had been treated by Dr. Bergman in early childhood, in two newly filmed interviews in which these two women, now with families of their own, reflect on their lives. 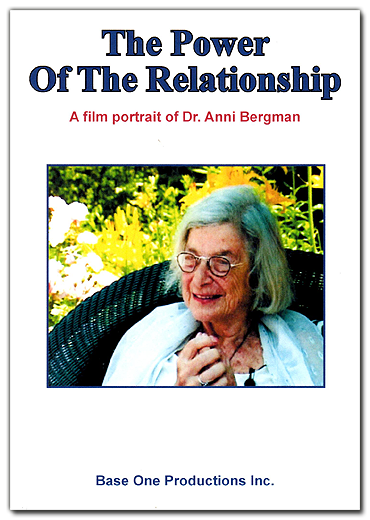 What emerges most clearly in this inspiring and warm portrait is Dr. Bergman's conviction that relationships-- whether in families or in therapy-- have the power to allow every human being to emerge as a more fully realized self. For additional information or to place an order, contact Child Development Media, Inc www.childdevelopmentmedia.com or call 800-405-8942.